Jason Bourne is back – and this time you'll understand why. Director Paul Greengrass has reunited with star Matt Damon to bring us the perfect 'soft reboot' of one of the best actioners ever devised. The stakes were always high. The original Bourne trilogy made James Bond up his game – along with Austin Powers, of course – and the departure of Damon and Greengrass mean the fourth film was an ill-fated branch-off starring Jeremy Renner that bemused audiences. Thankfully, for this fifth instalment, Bourne is back with a vengeance. Literally. 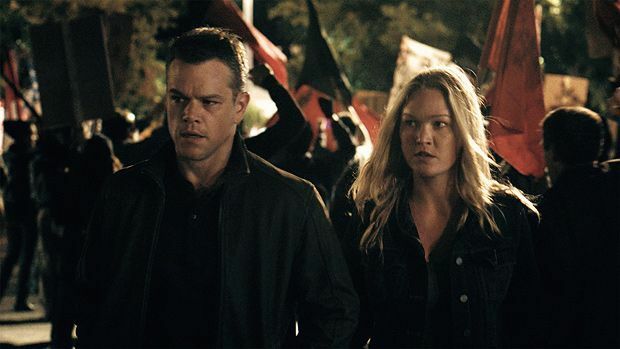 Bourne – aka Webb – (Damon) is contacted by old associate Nicky (Julia Stiles), who reveals important information about his late father and, subsequently, Bourne's real identity. In doing so, Nicky accidentally brings Bourne directly into the line of fire of CIA Director Dewey (Tommy Lee Jones) and new nemesis Heather Lee (Alicia Vikander), who swears to tame or terminate him. Ignore the quibbles. (There always are with spy thrillers; 'Oh why didn't she wear a hairnet?' or 'How did he get that thing in the car?'). Just enjoy absolutely stonking action like you haven't seen in years. Vincent Cassel's face seems purpose built to star as Asset, the most cold-hearted CIA operative. Tommy Lee Jones' lighting could not get more demonic. While the men are allowed – or even encouraged – to age, the women are all young and pretty. Of course it's for the storyline that Heather Lee is referred to as 'the girl' by her bosses… Go on! Get us angry! Damon is sensational as Bourne/Webb; beautiful in flashbacks, emotive and somber, dashing and exciting. Extra credit goes to Christopher Rouse's editing, the script (by Rouse and Greengrass) and the exquisite chase scenes. Plus, there's one hell of a stunt towards the end, the likes of which… well, you might have to see this one twice. General release fom Wed 27 Jul. Jason Bourne (Damon) is back with a vengeance, literally this time, as information about the death of his father leads him to go up against CIA Director Dewey (Jones) and new nemesis Heather Lee (Vikander). Stonking action, high stakes, amazing chases, Damon is sensational: the perfect 'soft reboot'.